TOWIE SNEAK PEEK: You’ll never guess who’s back? Another day, another drama for The Only Way Is Essex crew tonight. And this episode will see the return of a familiar face, the reunion of one couple, and the breakdown of two others. After weeks of texting scandals, shouting matches and drama, it looks at though Pete Wicks and Megan McKenna are finally laying it all to rest and putting the past behind them. After braving the parents last week, Pete is now going above and beyond to win back Megan’s trust by booking a spa weekend away with his Essex co-star. Even though Megan does insist on having separate bedrooms, it appears as though Pete might have finally cracked Megan with this gesture. After a romantic dinner and then being served breakfast in bed, Megan gives into the flattery and agrees to give the relationship one more chance. Maybe that Rolex wasn’t such a waste after all, Pete. And guess who’s back this episode? Well, it’s only the one and only GC! 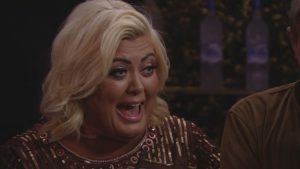 It’s almost as if Gemma Collins can sense when things are starting to calm down, so obviously has to take it upon herself to give things a good old stir in voicing her criticisms about badboy Pete. 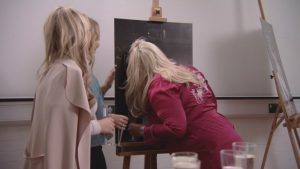 GC also gets a little cheeky with a portrait of her dream boy Jon Clark at the launch of Diags’ celebrity calendar event. Things are going from bad to worse for Amber Dowding, who is still struggling after her split from Chris Clark. And to make matters worse, she is forced to confront Chris’ brother Jon about the breakup, who is rumoured to be, say, not the biggest fan of Amber. They aren’t the only couple having a tough time in Essex. 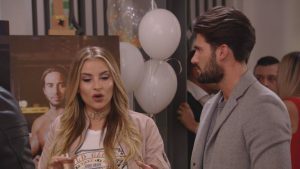 Kate Wright’s ongoing ordeal with her ex Dan Edgar isn’t helped by Danni Armstrong and Georgia Kousoulou, who decide to attack Dan about his questionable behaviour. Yet another attempt to talk things out eventually ends with Kate storming off in a fit of rage. This is starting to sound like a broken record, guys! How long will Pete and Megan be able to keep the peace? And will the other Essex couples ever be able to find it? The Only Way Is Essex continues tonight (Wednesday) at 10pm on ITVBe. « Which Strictly Come Dancing contestant might be forced to quit?